Beginning of March, 2016 Chokyi Nyima Rinpoche and a group of monks and volunteers helped save and release 100,000 fish that would otherwise be killed and eaten. 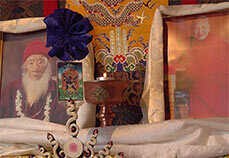 A short video message from Chokyi Nyima Rinpoche. We would like to extend our heartfelt thanks to all of you who supported this year’s 30 day ngöndro retreat for our Himalayan sangha at Ka-Nying Shedrub Ling monastery. 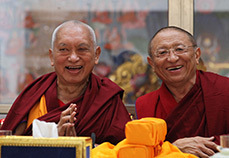 Kyabje Taklung Tsetrul Rinpoche and Kyabje Sangye Chatral Rinpoche have recently passed into parinirvana. Chokyi Nyima Rinpoche shares some words and prayers with us in the following video. Wishing you all a happy, healthy and prosperous new year 2016! Today Lama Zopa Rinpoche invited Chokyi Nyima Rinpoche to perform together a Padmasambhava feast offering at Kopan nunnery. An exciting day during the annual fall seminar at Boudhanath: In the early morning Rinpoche, a group of experienced monks and participants of the seminar practiced a short Chod session together. Mingyur Rinpoche visited Ka-Nying Shedrub Ling Monastery today. After a short tour through the old temple and the temporary new shrine hall, family and friends enjoyed lunch together. Pledge to Rebuild – Please join! I would like to share with you a documentary on the impact of the recent earthquakes on Ka-Nying Shedrub Ling monastery and Nagi Gompa. 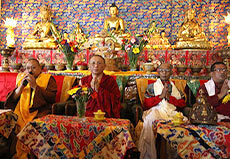 These monasteries have served thousands of local and international students of all types over many decades. 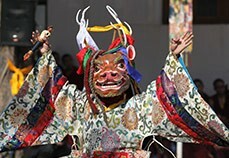 On June 6th, a great ceremony was held at Ka-Nying Shedrub Ling Monastery. 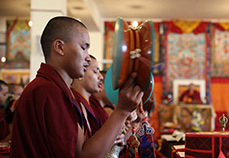 During a full day Chod ceremony, eminent teachers, from all three Buddhist vehicles joined this unique event to practice together.